Crazy for Ewe – "Sally Melville"
Thank you everyone for your comments on the post about 5 things all great patterns share! As promised, I will share those designers whose patterns have been consistently stylish, accurate, clear, detailed, and broadly sized. First, of course, is the incomparable, Sally Melville. First, for a novice knitter, or a novice sweater knitter, there's no one better than Sally Melville. Her early books, The Knit Stitch and The Purl Stitch, were absolutely ground breaking, and they remain my go to books recommendations for all newer knitters. They are, first an foremost, learn-to-knit books, but the patterns are good-looking, flattering across a wide range of body types, and well written. Each pattern teaches you a new skill and builds on your previous lessons. Sally shows you exactly what you need to know exactly when you need to know it. The schematics are wonderfully detailed, showing you where the shaping occurs and indicating where you would lengthen or shorten the garment to suit you. If you work through these two books, you will be quite an accomplished knitter, and you will have a broad and deep understanding of knitting, knitted fabric, sweater construction, and more. Plus you'll have several fabulous new wardrobe staples that you'll reach for again and again. I have knit two Einstein Coats, a Caddy Sweater, the Simple Roll Neck Shell, Faith Jacket, Collar Closing Cardigan, and L'Envelope, and more. They are all wonderfully written, and they work. Sally's latest book, Knitting Pattern Essentials, is a comprehensive look at pattern construction and gives you the skills to draft your own patterns. Even if you're not interested in designing, having a clear understanding of pattern drafting will help you power through those other patterns that are not as clear and accurate as we might like. Finished! Purple! Gorgeous! Hail, Mary!! Is there a more wonderful experience for a knitter than finishing your first sweater, and having it turn out to be EXACTLY what you wanted? Wonderful, flattering fit, great color, wonderful stitch textures, plump, bouncy yarn that's a delight to work with; and, for the piece de resistance, PERFECT buttons! That's the experience that our delightful Mary Burns, a La Plata regular, is celebrating now. She wanted a comfortable, easy sweatshirt-style sweater that would look good tossed on over jeans and boots. She picked the "To the Cottage" pullover design by Sally Melville, published in The Purl Stitch (one of those books that, trust me, every knitter should have in her library). Worked in deep purple Karabella Aurora 8, washable pure merino, worsted weight. As you can tell, Shop Dog in Chief Caspian approves wholeheartedly. Four paws way up for the Aurora 8 sweater, Caspian says! The stitch pattern is a challenge, but Mary did a terrific job. And as always with Sally Melville designs, the finishing touches (rolled reverse stockinette edges, a two-button henley-style placket, comfortable rounded neckline) take the project to a whole other level of custom-garment refinement. Congratulations, Mary! That's the most amazing "sweatshirt" ever!! As those of you who follow us on Facebook know, we received (finally) our shipment of beautiful Malabrigo Rios. A gorgeous 210 yard hank of hand-dyed merino. Oh, and did I mention that it's machine wash and dry? Mary whipped up this adorable topper with just two skeins of the Lotus colorway. The pattern is "The Not Knit Round Scarf" from Sally Melville's The Purl Stitch, terrific book with great patterns and even better guidance. 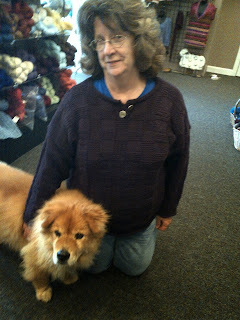 Susan came in today to have some company while she set in the sleeves of her cardigan. Doesn't it look great! Fits her perfectly too. And yes, that's a Hitchiker scarf she's wearing with it - good looks, Susan! Sally Melville's Simple Cardigan has been enjoying quite a bit of popularity in the La Plata shop. Molli finished hers, and Susan has completed the knitting and now just needs to put it all together. Great job, Susan! Molli finished Sally Melville's beautiful cardigan from The Purl Stitch. This is Molli's very first sweater. Didn't she do a fabulous job! So, black silk found, here is the Faith Jacket. I love this jacket. In fact, I think it's my favorite garment of the year. Like so many of Sally Melville's designs, it's so easy to wear, and universally flattering. And speaking of Sally Melville, don't forget that she's coming here to little old Leonardtown this spring. I learn something new every time I knit one of her designs, and I can't wait to bask in her presence for two days. We'll begin registration for those classes in November, so watch your newsletter and this blog for more details. I never really appreciated the story of the prodigal son. I was a fairly well-behaved child; I did what was expected of me and never got into too much trouble. So the idea that a brother who shirked his responsibility and skipped town would get a great big party when he deigned to come home, always seemed really unfair.I’ve heard lots of sermons on the topic, and it still irks me. However, in light of recent events, I might be able to understand the joy and delight of something that had been lost. Like my stupid yarn. Granted, the yarn didn’t walk off by itself, but I’m sure it was tempted plenty of times. This Faith Jacket is worked in La Boheme, Jamaican Spice, with the most gorgeous shades of purple cinnamon, burgundy, and black. The colors melt into one another in a very pleasing way. The rayon boucle and mohair compliment each other off perfectly, and the effect is quite spectacular. Enter black silk yarn. The purpose of the black silk is to provide a contrast and relief from the multi-color strips. And I never thought too much about it - until Saturday morning when I couldn’t find it. By Sunday I was obsessing, and by Monday I could think of little else. Even the lovely La Boheme couldn’t cheer me up. So, when I found the silk Tuesday, I was thrilled. It is cause for celebration. Come Friday morning and we’ll have a party for the prodigal yarn. Oh how frustrated I am! I’m just a few stitches away from completing my Faith Jacket, and I’ve run out of yarn. I have more in the shop, but this stuff is 165 yards per skein, and I need maybe three yards. So, this I can deal with. 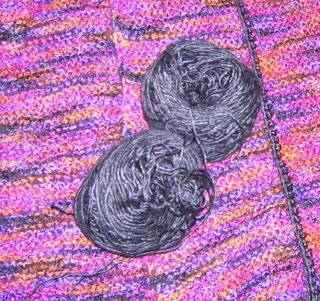 However, I am so unbelievably stupid, that I’ve lost two skeins of black silk I was using to crochet the strips together. How do you lose two skeins of yarn? I’ve asked everyone who was in on Friday if they had seen it, but no one has. These wonderful women helped me look, and even looked among their own things, but to no avail. Perhaps I put it “in a safe place”; perhaps I accidentally tossed it when I was cleaning up. Note to self: never clean up. This is so frustrating. I don’t deserve this jacket. So, today, I went to the shop and scoured everything. It’s not in the sale bin. It’s not under the table. It’s not in any of my dozen knitting bags. Not in the car; not in the bedroom; not under the bed; not on the sofa; not under the chair. Not in a box, not with a fox, not in a train, not in the rain. I do not see it here or there, I do not see it anywhere. So my stomach churns with the following thought: Is it possible that I threw it out? Possible, yes. Perhaps even likely. My mother once lost a bank envelope containing $500. She found it in the trashcan in the garage. Would I go dumpster diving for 2 skeins of black La Luz? Maybe – only the dumpster’s been emptied. So, I’m so angry with myself that I cannot even knit. For me, knitting is a little reward I give myself when I’ve completed my work. Something that brings me joy. I don’t deserve joy. I’m careless and disorganized. 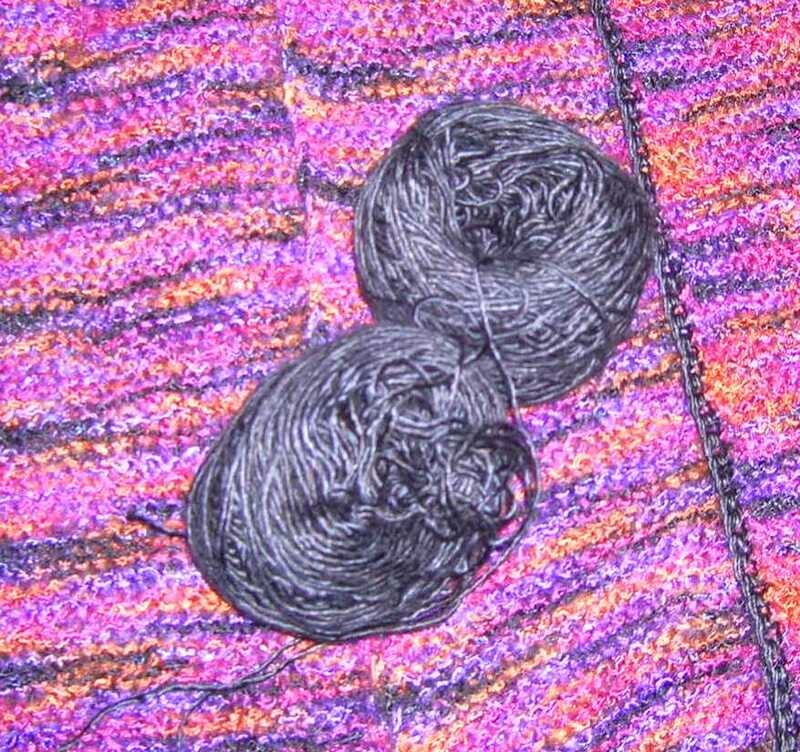 I need to be in the stocks with a sign over my head that says: “Ye stupid knitter – lost 2 skeins precious silk” I deserve to be pelted with skeins of Red Heart yarn in garish neon colors. I should be forced to knit acrylic yarn with bent aluminum needles. That would teach me to be more careful. So, what to actually do. I ask myself, What is this jacket called again? Faith. Hmmm. Perhaps I'm not meant to finish this jacket right now. Perhaps there's something more critical to be done. But what? Who knows. But until then, I will wait, and I will have faith.